Discover the most advanced control system on iOS devices: Compass Control® Pro. System integrators have been asking for a simple plug-n-play solution for complete control and signal management under one brand, especially when working with multiple brand subsystems. Our answer - Compass Control® Pro System. Fully customizable and made to work for you, on your device choice, according to your projects specifications. What can Compass Control® Pro bring to your business or project? Innovative and flexible solutions, scalable to any size business or government organization. All delivered in an elegant, user-friendly interface. Begin by downloading FREE iOS Demo App available on the App Store complete with functional market demos. Demo App is a great sales tool and can be activated to become a functioning custom controller with Key Digital Compass Control® Pro Enterprise Software License. Compass Control® Pro Demo App is a FREE Download from the App Store. The app can be activated for use as afully functioning controller with Compass Control® Pro Enterprise License. Get help designing a high quality, fully integrated & controlled system with Key Digital® System Design Group (SDG™). Key Digital offers system design services FREE* to our dealers and resellers. Compass Control® Pro brings ease of remote programming via Compass Navigator® PC software, allowing for remote system troubleshooitng and upgrades, as well as giving our dealers ability to work with our Compass Control® System Programmers to create and implement trouble-free control systems to their customers. 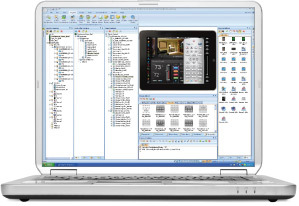 Programming the Compass Control® Pro System requires the use of the Compass Navigator™ PC Software, capable of both basic and complex programming. All of our Authorized Compass Control® Pro Resellers receive FREE Online Training & Certifications designed to introduce our dealers to the system. Compass Control® Pro instantly integrates third party components from Compass Alliance™ Partners to create an entire plug and play system when combined with product from any of our partners. Our team is constantly working on adding Compass Control® Pro bi-directional drivers / GUI modules for Compass Alliance™ Partners. Browse our module library and download modules/materials. Compass Control® Pro systems can be purchased through Compass Control® Certified Dealers Worldwide. Our dealers are Certified Compass Control® Programmers and will provide you with a customized system design centered around Compass Control® Pro ecosystem – giving you a built-to-order scalable hardware/software solutions. Looking for a video on system introduction or a technical guide on Compass Control® Pro system programing? Start here. Key Digital highly recommends that all resellers use 3rd party Certified Installers to program and troubleshoot the Compass Control® Pro Systems. *Compass Control® Pro products are available to certified resellers only. Certified reseller must still hire authorized Compass Control® Pro Certified Installers & Programmers or program at their own liability. Key Digital highly recommends that all resellers use 3rd party Compass Control® Pro Certified Installers & Programmers to program the system. Prior to purchasing Compass Control® Pro products all resellers must complete C1, C2, and C3 Compass Control® Pro Certification Trainings. Installation time may vary depending on size and complexity of the system, as well as installers training on Compass Control® Pro. Compass Control is a registered trademarks of Key Digital Systems Inc. Compass Navigator, and Discover The Possibilities are trademarks of Key Digital Systems Inc. iPod touch, iPhone, and iPad are registered trademarks of Apple Inc.